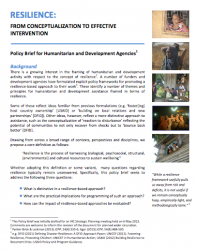 This policy brief seeks to address the following three questions: What is distinctive in a resilience-based approach? What are the practical implications for programming of such an approach? How can the impact of resilience-based approaches be evaluated?